Driving down the Pyrenees after spending a week in the mountains, I was on my way to Toulouse to meet Alison on her return from French Guiana. I had two days before our rendezvous at the train station but my only plan was to visit Airbus the morning we were to meet. Otherwise, I was just making short jumps towards Toulouse without any plans or commitments. That I had no plans for the other two days will come as no surprise to those who read my article about discovering Aulus-Les-Bains. I know I am lazy when it comes to planning. However, sometimes it works out for the best. This is one of those times. During my descent to the plains around Toulouse, I passed numerous road signs enticing me to visit various historical sites in the Midi-Pyrenees region. Frankly, it’s hard to drive for 5 minutes in France without tripping over something of historical significance. The Midi-Pyrenees is no exception with signs for “Grand Sites” at every crossroad. It’s not that I am drawn to caves, in particular. It was the sudden realization I had this opportunity to explore new places but I was skipping them simply because I was focused on getting somewhere. I was in a hurry for no reason. I had nowhere to be. 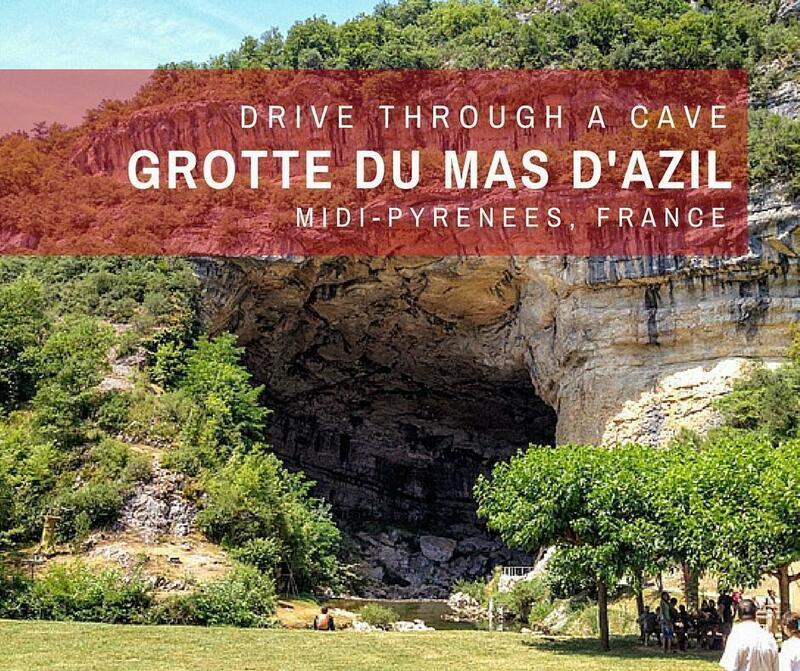 This is how I discovered the only cave in Europe you can drive through in a car (or a motorhome), the Grotte du Mas d’Azil. Alison would be the first to say my random discovery was not so random and, in fact, was completely predictable because I like driving on small, winding roads. Squeezing our motorhome through a cave is exactly the type of thing she’d expect me to do, wincing as the road got narrower but secretly loving it as well. However, let me be clear about the size of the Grotte du Mas d’Azil. It’s not as if the cave is barely big enough for vehicles. It is massive, measuring 420m long by 50m wide by at least 50m at the entrance. 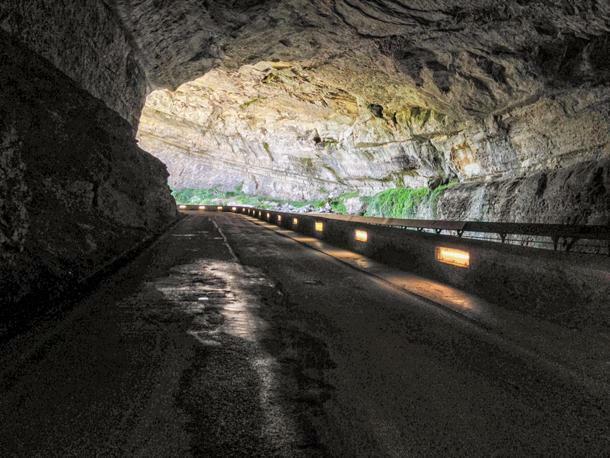 The road is tucked against one side of the cave and is not so massive. The road enters the cave via a much smaller tunnel cut into the side of the cave mouth. This entrance is only the width of a single vehicle and barely big enough for our motorhome. Regardless, as I pulled our motorhome into the parking lot, I could only see the cave’s massive gaping maw. The Arive River was obviously much more powerful at one point, but today it slowly meanders through the open tunnel, making its way inexorably downstream. I walked alongside the river and into the mouth of the cave. Inside, the bright sun quickly gave way to murky darkness as I followed a path, with the river on one side and the road on the other. I had no idea what to expect at the Grotte du Mas d’Azil. Based on the number of people outside the cave lounging on the grass and enjoying a picnic, I figured it was mainly a park. 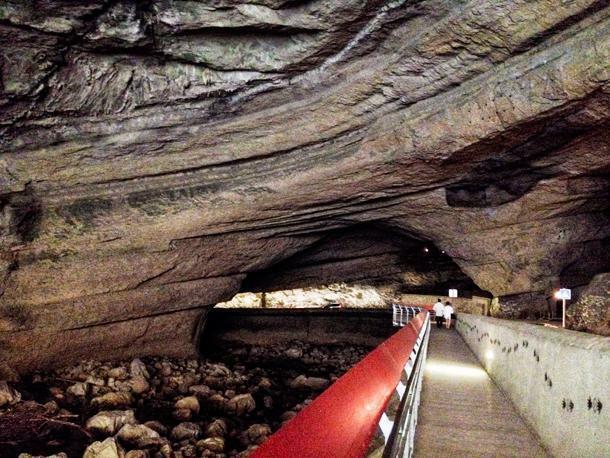 However, at the end of the path, about half way through the cave, I found the Museum of the Grotte du Mas d’Azil. 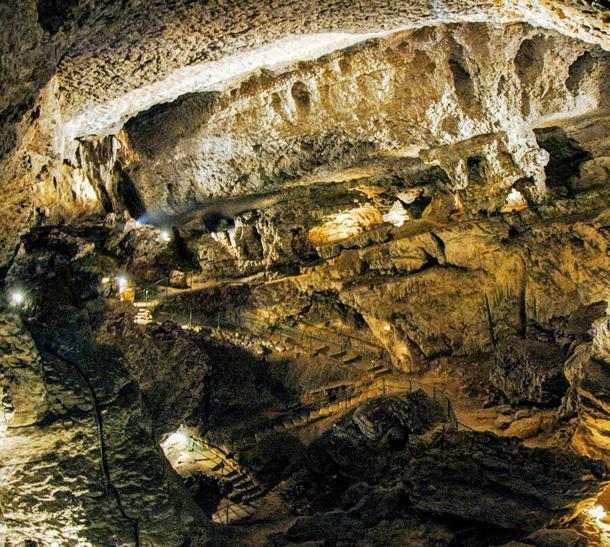 The Grotte du Mas d’Azil has been around millions of years and has been inhabited by humans for tens of thousands of years. 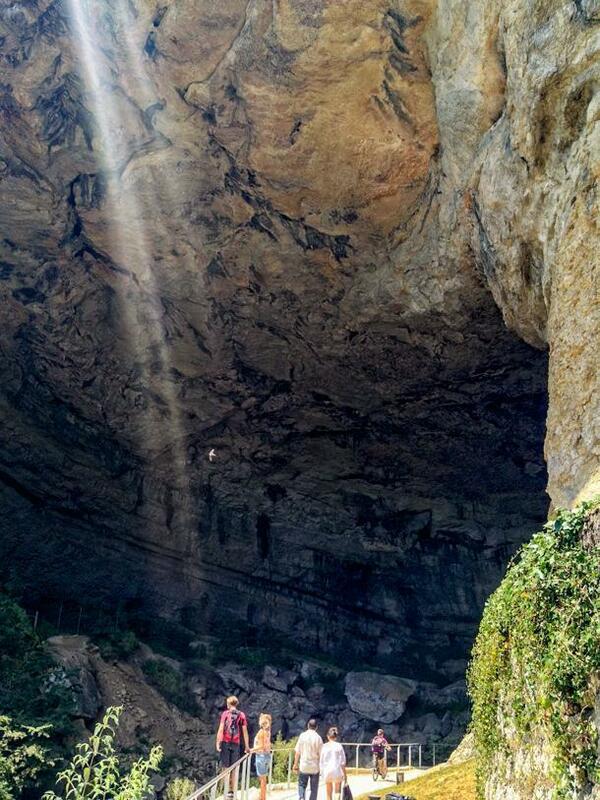 It was originally carved out of the limestone by the Arize River but the historical significance of the cave was only discovered when the road was being built. Countless archaeological digs over the last 150+ years have uncovered the bones of mammoths, wooly rhinoceros, and cave bears. They’ve also uncovered the 14000-year-old skull of a young girl and numerous examples of cave art, not unlike the paintings found in the caves at Lascaux. The Grotte du Mas d’Azil Museum provides an easy to understand overview of the site, the archaeology, and the history. Although most of the artifacts found in the caves are now displayed in a dedicated pre-history museum in Mas d’Azil, the real reason to visit the museum is to join one of the guided tours. Unlike Lascaux, at the Grotte du Mas d’Azil visitors get to visit the actual caves, see the bones of animals frozen in the stone and witness the cave art in place. I enjoyed exploring the caves and seeing the size of some of the spaces. These caves have been used as a shelter for thousands of years, most recently to shelter Protestants during the Wars of Religion. The tour also includes the inevitable light and sound show. I’d rather just focus on exploring the caves, but apparently some people enjoy seeing the caves lit up. If it was a live concert in a cave, I might be interested. The Grotte du Mas d’Azil isn’t finished revealing her secrets. Evidence of human occupation was discovered on the bank of the river opposite the road, just inside the cave entrance. Archaeologists speculate small camps or villages were set up inside the cave mouth as protection from weather and for defensive purposes. This is the next area to be explored and excavated once funding has been secured. In all, I spent about two hours at the Grotte du Mas d’Azil. I didn’t visit the prehistory museum in the town as it was closing by the time I finished in the caves, but I would certainly suggest it as part of an itinerary. I would also suggest taking a picnic and enjoying lunch in the park, overlooking the cave’s huge mouth. There are free public toilets and a small restaurant in the park, so you can make an enjoyable day’s visit to the area. Time and again, I’ve found myself amazed at the places and things we’ve experienced during our travels that feel undiscovered. I wonder if it’s just me. 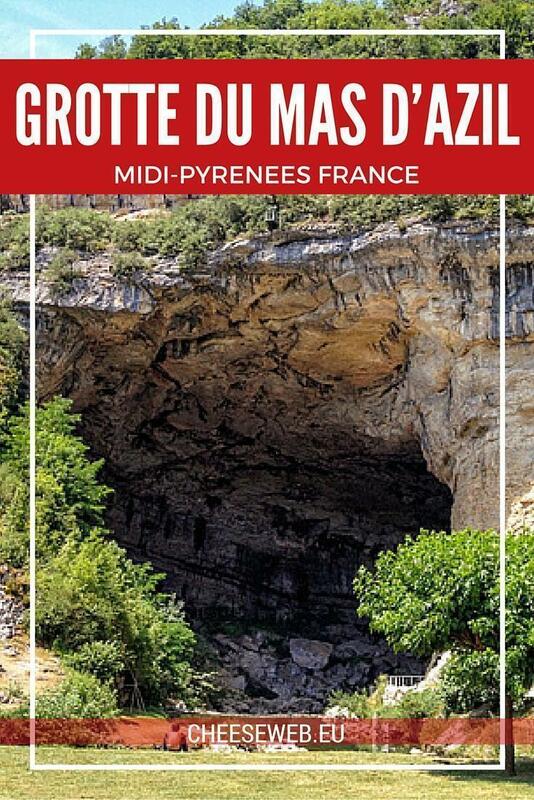 Maybe everyone else knows that sites like the Grotte du Mas d’Azil exist and I’m just slow to catch up. Or maybe there is just so much to discover in each country, it’s impossible to experience everything. This ability to explore places known only to locals, in a country with as many tourists as France, is what I love about slow travel. 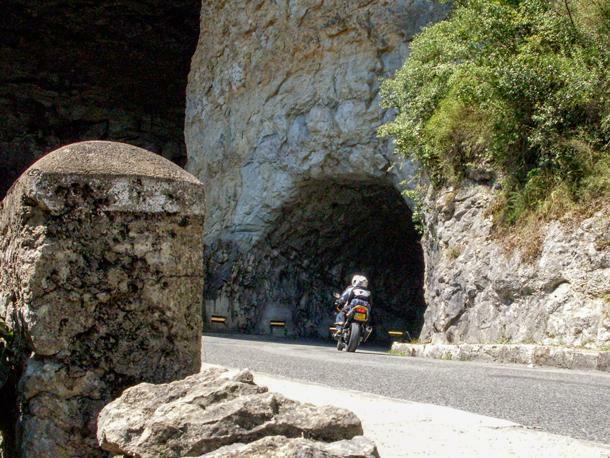 As you will expect as I left the Grotte du Mas d’Azil, I drove through the tunnel in our motorhome, Amelia. The tunnel entrance was narrow and, fortunately, there was no oncoming traffic. If you are curious, you can check out the Mas d’Azil route on Google Street View. I love driving these kinds of unique roads. They are what make road-trips so memorable. 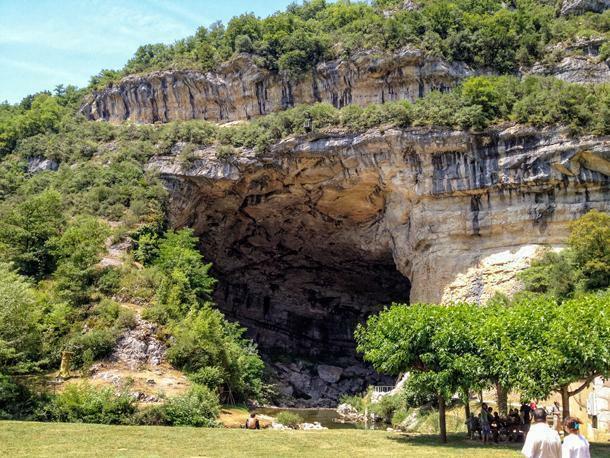 Driving through the Grotte du Mas d’Azil – We fit! I’m thankful I turned left.